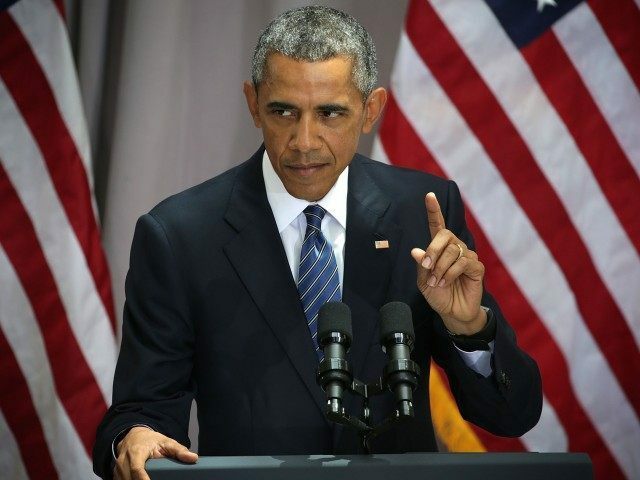 President Barack Obama defended the Iran deal in a speech Wednesday, accusing Republicans in Congress of “making common cause” with the hard-liners of the Iranian regime by opposing it. Obama addressed an audience of students and journalists at American University. Obama made the accusation towards the end of his address, despite complaining, in his introduction, that critics of the Iraq War had once been treated badly. The partisan message was less an appeal to the nation and more an appeal to wavering, undecided Democrats. Drawing parallels to Presidents John F. Kennedy and Ronald Reagan, Obama noted that both had negotiated arms reduction treaties with the Soviet Union. After that perfunctory appeal to history and statesmanship, Obama launched into a characteristic partisan attack. The Iran deal was opposed by “the same mindset, in many cases offered by the same people, who seem to have no compunction with being repeatedly wrong,” Obama said. He criticized Israeli Prime Minister Benjamin Netanyahu, saying he was simply “wrong” about the deal. Obama asserted that the deal enjoyed the support of “the vast majority of the world”–omitting that most Americans oppose it. He mocked those who called for a better deal “that relies on vague promises of ‘toughness’–though Obama campaigned on “tough diplomacy” in 2008. The president made several dubious claims about the deal, such as that “after 15 years, Iran will never have the right as cover to pursue a nuclear weapon.” That promise rests on trusting Iran’s parliament to ratify the Additional Protocol, which it is under no pressure to do. Obama made no mention of the “side deals” between the International Atomic Energy Agency (IAEA) and Iran, which have not been shown to Congress and which reportedly allow Iran to take its own samples from military sites suspected of being used for nuclear purposes. Journalists watching the speech seemed most skeptical about Obama’s assurances that U.S. intelligence would be able to detect cheating by the Iranian regime. In a speech that criticized the Iraq War, that claim seemed “misplaced,” said Jeffrey Goldberg of the Atlantic. Obama also argued against “surgical strikes” on Iran–almost two years after he himself made the case for surgical strikes on Syria. He also said that despite the Iranian regime’s anti-American rhetoric and shouts of “Death to America!”, not everyone in Iran felt the same way. “Just cause hardliners chant ‘death to America, doesn’t meant that’s what all Iranians believe.” No just the Iranians who run the country. The only legitimate opposition to the Iran deal that Obama seemed willing to countenance was opposition from Israelis. Not once in his address did Obama grant American critics of the Iran deal any benefit of the doubt. Hence his suggestion that Republicans are treasonous. Obama tried to reassure the nation that Iran had made a “permanent commitment” not to build a nuclear weapon. He did not note that Iran has violated previous nuclear agreements, or that history is replete with examples of totalitarian regimes breaking their promises of peace. Obama reiterated that war would break out in the near future if Congress rejected the Iran deal, and added that the dollar’s place as the world’s reserve currency could be threatened. The speech likely convinced few skeptics, but showed just how much pressure opponents face.